Crisscrossing Southern Africa – CRISSCROSSING SOUTHERN AFRICA! Exploring The Okavango Delta ! Back to writing and creating memories of our trips to one of the most unique wilderness destinations in the world – the Northern parts of Botswana. One of the least populated countries in Africa , second only to Namibia, Botswana is a rarity in an overdeveloped , overpopulated world. It has untamed, vast pockets of wilderness . We’ve done these trips a couple of times making our hearts yearn for the Delta ever so more ! The Okavango Delta is a vast inland river delta with an unique ecosystem, spread over the northern part of the Kalahari basin. It is known for it’s sprawling grassy plains which flood seasonally, becoming a lush animal habitat. It was declared a UNESCO world heritage site in June 2014. The Okavango river is the longest river system in southern Africa. It is formed mainly by the Cubango and Cuito rivers which arise in the rain soaked highland plateaus of southern Angola.These then congregate south of Dirico in Angola , to form the Okavango River .This then flows across Namibia’s narrow Caprivi Strip dropping four metres in a series of rapids called Popa Falls (visible in the dry season ) just before entering Botswana. This rainwater takes approximately one month to reach the Delta and then progresses slowly for the next four months flooding the plains and filling the channels of the Okavango Delta. The Delta is maximally flooded in June . The Okavango River enters Northwestern Botswana at Mohembo. This water gives refuge to many forms of life unexpected in a ‘desert’. The Okavango River system is made up of the main perennial river channel called the Panhandle and numerous small seasonal rivulets which fan out southeastwards forming the massive Okavango Delta. The Panhandle begins at Mohembo and extends down for 80 kms. Here the river is wide, deep and perennial with a vast vegetation of Papyrus beds and Phoenix Palms. The main attraction of the Panhandle is fishing, birding and relaxing in houseboats. Parallel faults deep below the Kalahari sands control the direction in which the Okavango River enters and exits the Kalahari Basin. The fan shaped Delta emerges at Seronga, after crossing the upper parallel fault line at Gumare – which is the continuation of the southwestern part of the Great Rift Valley of East Africa. The water then spills over the sands of the Kalahari basin ( a tectonic trough in the central part of the endorheic basin of the Kalahari ) forming an inland freshwater alluvial Delta, a 6000 square mile maze consisting of channels, lagoons, small lakes, flooded grasslands and islands of many shapes and sizes. Some of these islands are fungi growing termite mounds ( termitaria ) on which vegetation flourishes. Others are formed by the the endless amount of silt coming down from the Angolan highlands and the largest ones like Chief’s Island have formed because of tectonic activity. The Delta is moving imperceptibly and changing constantly as it lies in the African Rift Valley. The majority of the water of the Okavango slowly dries up (transpiration and evaporation ) and never reaches the ocean. Only about 2-3% of the water makes a journey forward. The waters are blocked by two southern faults , the Kunyere and the Thamalakane which redirect the Delta’s myriad channels. The latter acts as a 150 mile long natural dam, here the channels abruptly change direction and join to form one river, the Boteti which flows eastward through a break in the fault and discharges seasonally ( rainy season) into Lake Xau and the Makgadikgadi Salt Pans , which features a rainy season wetland where flamingoes congregate every rainy season! A small channel, the Nghabe River continues southwest towards Lake Ngami, serving as both inlet and outlet depending on the strength and direction of the annual floods. The largest island in the Okavango Delta is Chief’s Island ( 70 x 15 km) . It was once the sole hunting preserve of Chief Moremi and was included in the Moremi Game Reserve in 1970. It is here that much of the Delta’s wildlife retreats as water levels rise. This island has a rich concentration of wildlife and it was here where the rhinoceros were reintroduced into Botswana. High end lodges approachable by air and boat are nestled on this island. The Okavango is also closely associated with the Kwando, Linyati and Chobe swamps and river systems to the northeast. It is still connected to the Chobe-Zambezi River system via the Selinda Spillway. It is thought that long ago the Okavango, Chobe, Kwando and upper Zambezi waterways flowed as one massive river across the Middle Kalahari to join the Limpopo River and then into the Indian Ocean! The best time to visit the Okavango Delta is between July to October. We started one bright July morning from Molepolole down the straight smooth, traffic free roads of Botswana and drove north past the Khama Rhino Sanctuary near Serowe. 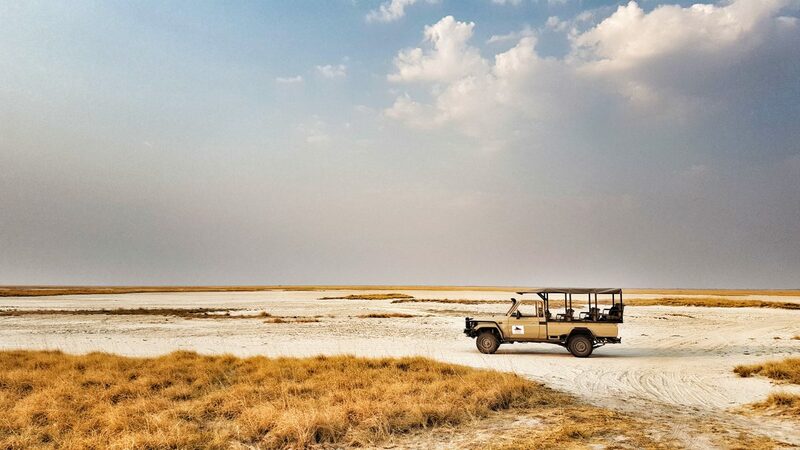 We then skirted the central Kalahari Salt Pans to reach Maun by late afternoon ( a distance of more than 900 Kms). It was a 9 hour drive which we did with a few stops for refueling the car and refreshments. Near Orapa while driving through Letlhakane, we were surprised to see a mountain of earth rise up from the flat Pans. We realised that this was years of excavated earth from the famous Diamond mines of Letlhakane. Maun ( Maung-the place of river weeds) is a small frontier town spread along the Thamalakane river. It is the tribal capital of the Batawana people. Maun is the tourism capital of Botswana and is the gateway to the Okavango Delta and the Moremi Game Reserve. It is the place to fuel up supplies before entering the Delta. There are enough shopping centres, lodges ,hotels and car rental services available in this small town. Maun has a small but very active International airport which receives flights from Johannesburg and has private charter flights to and from remote resorts within the Delta. Early next morning we were picked up from our lodge by our friend and guide Sox, a river bushman. He drove us in his 4 x 4 to the mooring point where he had a motorboat waiting for us. We then set sail on the rivulets of the Okavango River soaking in the clear blue water lush with papyrus reeds and water lilies. Motorboats carrying supplies to remote luxury resorts in the Delta. Leadwood and Mopane trees framed the banks of the rivulets. The common trees found in this area are the Mopane , Leadwood, Wild Date Palm , Jackal Berry (African Ebony ) tree , Sycamore fig tree, Real Fan Palm, African Mangosteen , the Knob Thorn tree and the Sausage tree . We saw a lot of wild life too. Red Lechwe, a small deer (exclusive to the Okavango),Sitatunga, Saddle Billed Storks , Wattled Cranes and Geese foraging in the shallows. There was no dearth of African Fish Eagles ,Malachite Kingfishers, Rufous bellied Herons , Plovers, Pygmy Geese, African Swallows , Slaty Egrets or Pel’s Fishing Owls either. An African Fish Eagle on the lookout for its next meal. A male Red Lechwe exclusive to the Okavango. A Lilac-breasted Roller , the National bird of Botswana. We changed our mode of transport at Boro village station, a community trust Mokoro station run by the Bayei tribe and got into mekoros with our poler guides. Mekoro are long narrow flat bottomed dug out canoes hewn out of ebony , sausage or mangosteen trees. They have been used by the Bayei for centuries to traverse the shallow floodplains of the Delta. (Some are made of fibreglass nowadays in order to preserve the trees). They are known as the 4 x 4 ‘s of the Delta because they can glide over even very shallow rivulets ( just 4 inches deep) . The only place they cannot traverse are the deeper channels as the water is too deep for poling. No sudden movements and silence were the instructions given by our poler guides as they poled us silently through the Okavango using a long ngashi cut from a Silver Leaf Terminalia tree. We swished silently through the reeds sitting low in our Mokoro’s getting a good look at tiger fish and bream swimming past in the crystal clear water. Docking at one of the islands. Navigating the clear waters of the Okavango in a Mokoro. We drifted past grazing elephants, crocodiles sunning on river banks & territorial hippopotamuses visible not far from the mokoro. Thumb sized painted reed frogs rode in the mokoro along with us. We made stops on small islands to have lunch and tea making sure not to wander too far as swimming lions are a known entity in the Okavango! Not that cheetahs , leopards , wild dogs and hyaenas are unknown entities. Midstream we were transferred back to the motorboat which had come upstream so that we could reach back faster before sundown.We sped back past grand cottages on the river bank, owned by the well to do people of the backwaters of the Okavango. We crossed a few South African families who were out for the weekend, some even nonchalantly dipping their feet in the crocodile and hippopotamus infested water! They were so much at ease in the water. Though we had heard of bilharziasis we found no evidence of any , but no harm in taking precautions against it and malaria. The tsetse fly has been eradicated from Botswana. Got back to the mooring point as the sun was setting , a beautiful end to a glorious day. Back to the Mooring Point after a spectacular day . Author Crisscrossing Southern AfricaPosted on March 10, 2018 Categories UncategorizedLeave a comment on Exploring The Okavango Delta ! Botswana , a landlocked Christian majority country achieved independence on September 30th ,1966. Prior to diamonds being discovered in 1967 ,it was a poor and peripheral British protectorate known as Bechuanaland. Since then with the diamond and beef trade Botswana has become a flourishing African economy. It’s currency Pula (rain) was established in 1976. Botswana was knocked down by AIDS in 1985, but has slowly moved up again with free medical aid for it’s citizens. It has been a pleasure experiencing this country and it’s neighbours over a period of time. The First Lady and the first President of Botswana. We live in a yard with other families protected by electrical fencing and two guard dogs (who have now become our house pets )! Early morning at the Yard with the moon still setting in the distance. Life in Moleps started with weekend trips to Gabarone -which entailed visits to Spar, Choppies, @home & our favourites- Cape Union Mart , Botswana Craft ,Square Mart with it’s Food Lovers Market & Kigale Mall thrown in at times. Got to experience very good food in Rodizio ( awesome meat cuts , grilled Kingklip ) , Ethiopian injera with goat stew in Abyssinia at River Walk Mall. Decent seafood and awesome lemonade at Ocean basket in Airport Junction Mall. Have had great wood fired pizzas & gelatos in an open air cafe/nursery called Sanitas near Gabarone dam . Also had similar fare at the Mokolodi Nature Reserve, which is just on the outskirts of Gaborone. Not to be missed is the Sunday Roast on the last Sunday of the month at Bull and Bush. On the day before this one can enjoy the Farmers’ Market where local farmers sell their fresh produce. Still have to visit Caravella & Beef Baron! When in Gabs one could check out the 3 Chiefs at the City Centre for a perspective of the history of this nation. CRISSCROSSING SOUTHERN AFRICA! Blog at WordPress.com.